Marvellous Monorails introduces an all-new vehicle type to Cities in Motion 2. 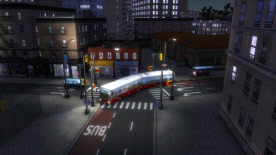 The monorail is a handy vehicle for inner-city connections and works best in circular lines. The pack boasts five different monorail vehicles, from the slow and large Toyoka Cybria City, to the super-fast, but high maintenance Stern-Berger Mate. An all new mode of transportation! They are fast, attract a lot of passengers, and give your city a novelty look with their elevated rails. When a metro line is too expensive, look to construct the monorail. Build circular lines for maximum efficiency and try all of the five different monorail vehicles to find just the right one for each line. When speed is what you want, Mate from Stern-Berger is your choice!